Osama Bin Laden & Christopher Dormer: Alive & Well? Their bodies were never found yet the news said conclusively that they were dead. The main reaction from their “stories” that were blasted by the so called mainstream media was fear, and it appeared that this fear is a tool of manipulation by the powers that be to cause citizens to readily give up their rights because they crave security over privacy it seems. To me it seems as though these terrorist attacks whether they’re domestic or foreign, seem to be played out hand in hand by the overenthusiastic news programs to work the people into a frenzy where they are putty in the hands of the government. If you’ve never seen my work before just know that I don’t hold back with my imagination in my quest to make you think. So whether you agree with me or not, just allow yourself to think beyond your mental boundaries. Is your sense of patriotism being used against you for someone else’s benefit? Are you sure that all you absorb from these so called trusted news sources are actually the truth or even partial truths? Do you find yourself in a grave sense of denial when someone points out something opposing to your beliefs that makes perfect sense? 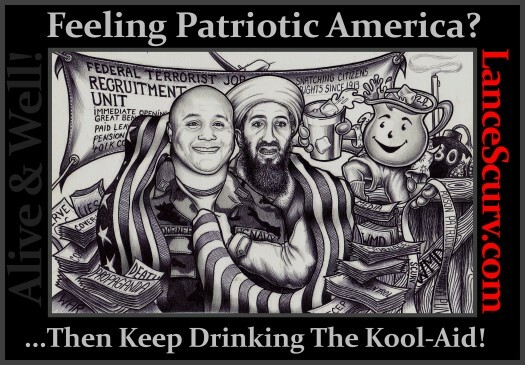 That’s what I meant by keep drinking the Kool-Aid, it’s just that blind trust that gets most of us in trouble with those in power to whom they give their faith to. What if Christopher Dormer and Osama Bin Laden were paid agents of the government to manipulate the minds of the masses and were compensated greatly to drop out of society to a distant land all subsidized by your tax dollars by your beloved U.S. Government? Check the sketch out in detail and hit me back with your thoughts on it! Get ready for the next one coming soon! Next : Separate Yourself From Mediocrity In Order To Manifest Your Divine Greatness From Within!